I often tell people that Oregon has the strongest forestry extension program in the country. One of the examples I use to illustrate this is Tree School. Tree School is a festival of learning for people who love forests. Each year, Oregon State University's Forestry & Natural Resources Extension Program hosts regional Tree Schools in various counties around Oregon. At Tree School, OSU faculty and other experts teach dozens of classes, covering everything from chainsaw safety to mushroom identification to wood product marketing. These courses complement the year-round educational programs offered by OSU Extension and its partners. Registration is now open for Tree School Clackamas, Tree School Umpqua and Tree School Rogue, although some classes are full at Clackamas. Information on all three of these Tree Schools, plus Tree School Klamath, which is scheduled for summer 2019, is available here. OFRI is a proud sponsor of Tree Schools each year, and we will have displays set up at each of the three upcoming ones with our educational publications for forest landowners. It’s a great chance to stock up. There will be plenty of excellent displays from our partner organizations as well. I encourage all Oregon forest landowners, and anyone else who has an interest in forests and trees, to join us at a Tree School this spring if you have the chance. You’ll be rewarded for your investment of time. I hope to see you in one of my classes. 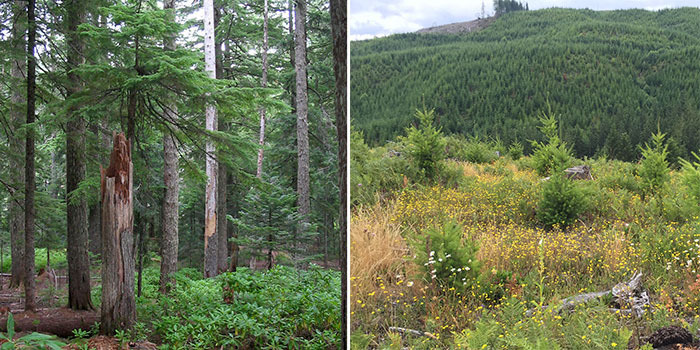 Forest managers in Oregon rely on research from many sources, including Oregon State University and the Pacific Northwest Research Station, to guide current management practices. Research findings inform their decisions on the best ways to manage forests to promote healthy wildlife populations as well as protect water supplies and other natural resources. As a wildlife biologist who works closely with Oregon forest managers to help them manage forests for wildlife, the recent article authored by Phalan et al., “Impacts of the Northwest Forest Plan on forest composition and bird populations” caught my interest. It focuses on the Northwest Forest Plan (NWFP), which dictates the management of federal forests in the region, 25 years after it first went into effect. The scholarly review indicates that species like the northern spotted owl, which the NWFP was written to help, are still in decline. The article goes on to suggest that this is due in part to a lack of older forests with big trees, also known as late-structure or late-seral forest habitat, on federal lands due to timber harvest and wildfire. It is well established that northern spotted owl populations continue to decline. However, this decline is due in larger part to competition from the non-native barred owl, and less so from a lack of habitat. It’s my understanding that the NWFP has actually led to an increase in late-seral habitat types. According to Forest Inventory and Analysis (FIA) data the U.S. Forest Service collects annually, from 2012 to 2016 an average of 92,173 acres of Oregon forests entered the 50-plus age class each year, while an average of 28,011 acres in that age class were harvested, yielding a net recruitment of over 64,000 acres annually. This data is specifically for areas managed under the NWFP and within 50 miles of the coast. This data clearly shows that we are working toward the goals of the plan. Growing bigger, older trees obviously takes time, and we’re only 25 years into a 100-year plan. The FIA data suggests that we’re working toward an abundance of late-seral habitat. That is, unless it burns up. The Phalan et al. article points to wildfire as a reason for loss of late-seral forest structure. I agree. Our federal forests need to be managed against wildlife risk. Wildlife-friendly fuels-reduction projects will reduce the risk of wildfire and support wildlife habitat. The Phalan et al. article also discusses how songbird species are in decline across all forest ownership types, including public lands managed under the NWFP and privately managed forests. Unlike the northern spotted owl, a lot of songbirds depend on younger forests dominated by tree seedlings and shrubs, also known as early-seral habitat. The importance of this type of habitat to songbirds has been a focus of recent research out of Oregon State University’s College of Forestry. In fact, the Oregon Forest Resources Institute dedicated an entire publication to this study. Just like late-seral forest habitat, early-seral habitat is a crucial habitat type and needs to be encouraged across all forest ownerships. I’m excited by the studies out of OSU that show biodiversity is being maintained in early-seral habitats through forest management. One of the fundamental purposes of forest management is to provide habitat for wildlife across the landscape. Because there is such a diversity of species that call Oregon home, it follows that we need a broad range of habitat types, from young forests to old growth and everything in between. That means land managers must focus their management to provide all age classes of forest. Conserving only older forests has the dual effect of losing young forest habitat as the trees grow older and losing older forest habitat to fire. We must do better. 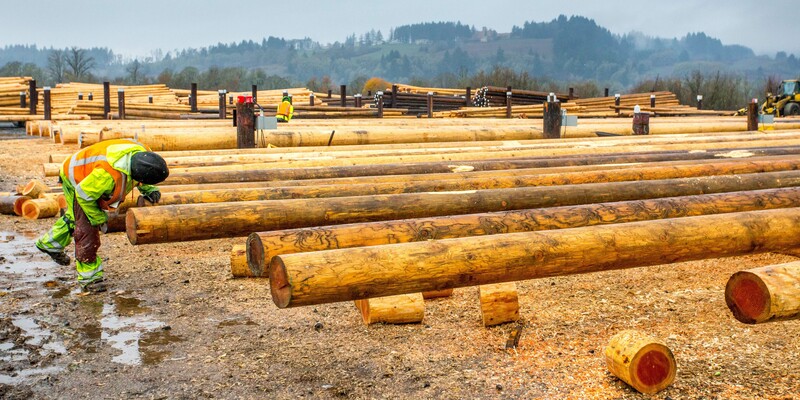 For something as prevalent and essential as utility poles, I’d never really given them much thought until late last year when I attended a tour of wood preservative treatment plants in Oregon hosted by the Western Wood Preservers Institute (WWPI). According to WWPI, around 120 million utility poles are in use in North America. That’s about one for every four residents of the U.S and Canada. The bulk of those poles are made of southern yellow pine, which more readily accepts treatment than most western species, but some 40 percent are Douglas-fir, nearly all of which come from the western forests of Oregon and Washington. Poles typically remain in service for around 60 to 70 years, and more than 100 years in drier climates, according to WWPI. An Oregon State University study said about 1 percent of poles are replaced each year. During the tour, we visited the McFarland-Cascade plant in Sheridan, where the majority of the poles processed are Douglas-fir because of its high strength-to-weight ratio and its propensity to grow straighter and taller with less taper than most other tree species. 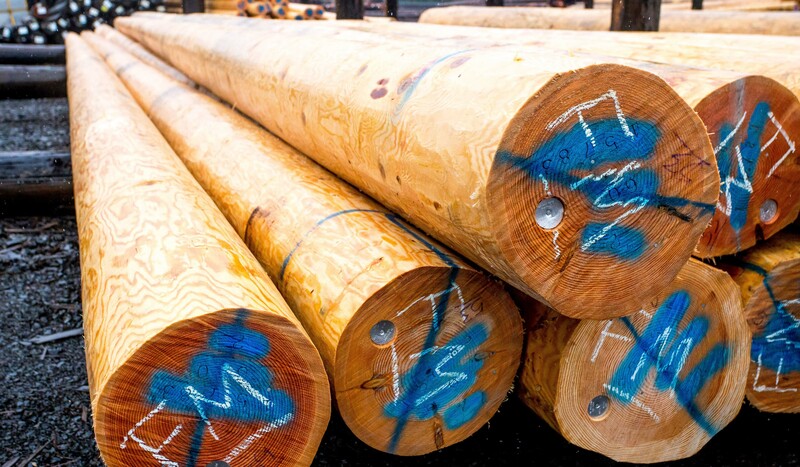 For applications requiring taller poles, Douglas-fir is the only species that can do the job. In addition to poles, Douglas-fir is also a preferred choice for crossarms, the wood pieces installed parallel to the ground that hold the wires and cables. Those transmission wires weigh a lot, so strength matters. And when it comes to strength, it doesn’t get any better than Douglas-fir. When disaster strikes, particularly in the West, Oregon comes to the rescue. Fires and wind can wreak a lot of havoc on utility poles, and the electricity they carry is critical to a speedy recovery after a natural disaster such as a hurricane or wildfire. In 2017 and 2018, Oregon utility pole producers responded to the California wildfires by quickly ramping up to help affected communities work their way back to normal. I asked about where the wood comes from, and learned that not just any Douglas-fir tree will do. Pole producers employ timber buyers who cruise proposed harvest areas and hand-select individual trees to be set aside and used for poles. Only about one in every 10 trees has the right characteristics, and pole producers pay a premium to get them. Once the trees are selected and harvested, they’re trucked to a processing plant like the one I visited. 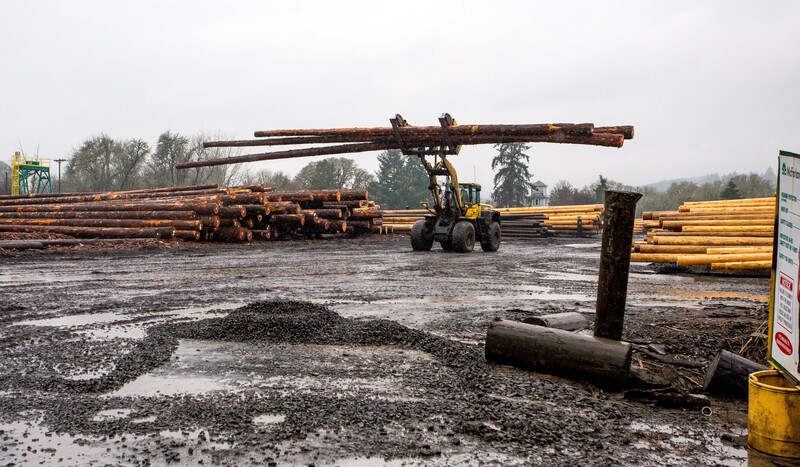 Douglas-fir poles can range in length up to 125 feet, so logs headed to pole plants are typically much longer than those headed to a sawmill or plywood plant. The first step at the treating plant is to run the logs through the “peeler,” which removes the bark as well as the cambium (a thin layer of fiber just below the bark). After the peeler, the poles are seasoned. Water is removed from the wood to make room for preservatives to be added and absorbed. The dried poles are sorted by grade and, if necessary, any defects are removed. The preservatives used to treat wood are regulated by the Environmental Protection Agency (EPA). All are designed to protect wood from biological and insect attack, and to stay in the pole. Leaching is very minimal, and the preservative will not travel more than a few inches in soils over the many decades the pole is in service. Having some preservative in the soil in the area immediately around poles actually has a beneficial effect of providing a more sterile environment for the pole to reside in, adding efficacy to the pole preservative. In addition to the EPA link above, the U.S. Forest Service Forest Products Laboratory published this about wood-treating preservatives. Whatever the preservative used, it is applied using a pressure-treating process. The wood is loaded into a long, metal pressure chamber, then preservatives are added and vacuum pressure is used to force the preservatives into the wood fiber. More details can be found at woodpoles.org, or check out this video. 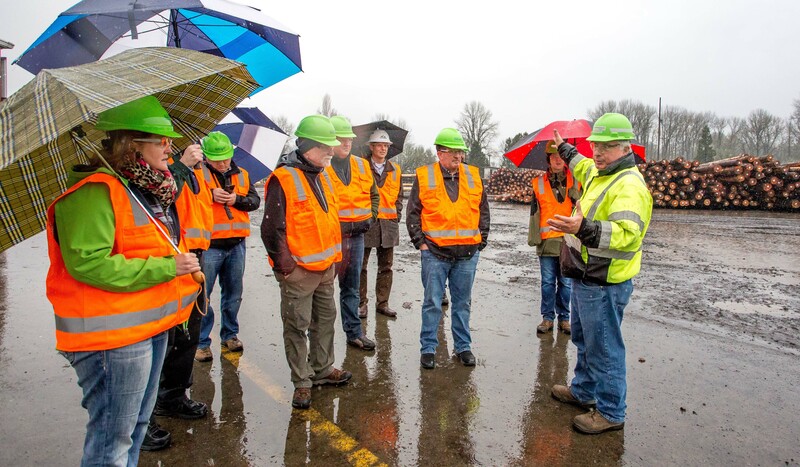 I left the tour marveling at the prevalence and variety of uses for Oregon wood products – from the materials used to construct some of the most complex and environmentally sound buildings in the world to thousands and thousands of simple, yet essential, utility poles. I started my forestry career as a tribal forester with the Confederated Tribes of the Colville Reservation in Washington and the Confederated Tribes of Siletz Indians in Oregon. Later, as an Oregon State University College of Forestry faculty member and now as an affiliate faculty member, I’ve worked on the college’s annual Starker Lecture Series for over 20 years. Given this background, it’s with great pride that I’ve been chairing the Starker Lecture committee this year – and I’m really excited that the 2019 series will focus on tribal forestry. All the Starker Lecture events are free and open to the public. Topics that will be covered during the series include indigenous forest and subsistence practices, the history and future of tribal forestry in Oregon, and how “first foods” such as fish, berries and big game drive forest management. Lectures will be held on Feb. 13, March 6 and April 10. 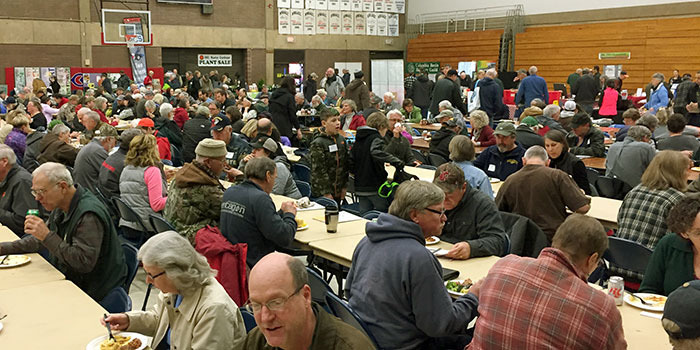 All start at 3:30 p.m. in the Construction & Engineering Hall at the LaSells Stewart Center on the OSU campus in Corvallis, which is located among the traditional homelands of the Kalapuya tribes. A reception will follow each of the three lectures. The 2019 Starker Lecture Series culminates May 30 with a field trip to the Siletz Indian Reservation, where participants will receive a firsthand look at active forest management for a variety of cultural and economic benefits. Registration is required for the field trip, and space is limited. The lecture series is sponsored by the Starker family in memory of T.J. and Bruce Starker, founders of the Corvallis-based company Starker Forests and prominent leaders in the development of the Oregon forest products industry. The series is also supported by the OSU College of Forestry and the Oregon Forest Resources Institute. The Starker Lectures are generally streamed live over the internet and archived at the Starker Lectures website. However, since the March 6 lecture relies on tribal oral tradition, it will not be broadcast or recorded for archive. More information about the lecture series is available here. I hope you’ll be able to join us for some or all of these events. I’m really looking forward to them.